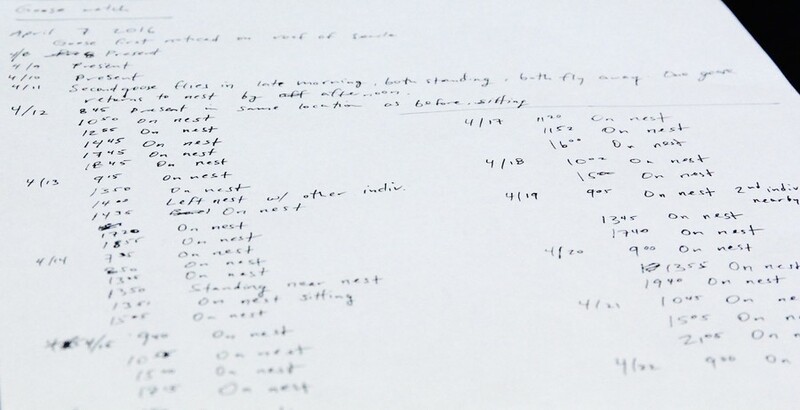 Aaron Olsen took notes on his observations of the Canada Goose. A female Canada goose is nesting and hatching eggs on top of the five-story Searle Chemistry Laboratory in the northwestern corner of the quad. Without any source of food or water, the goslings may have to jump down the building once hatched, unless another solution is found. Graduate student Aaron Olsen spotted the goose on April 8. A Ph.D. student in organismal biology and anatomy studying the evolution of bird feeding systems, Olsen has been closely observing the goose with a pair of binoculars from the Anatomy building. He keeps notes on the behavior of the goose. “I study the evolution of water fowls. It’s pretty close to what I research,” Olsen said. According to Olsen, the mother goose usually builds a nest and stays on top of the nest most of the day when she is laying eggs. The eggs usually hatch in approximately 20 days. In this case, Olsen estimates that the goslings will probably break out of the shells around early May. The goslings will have to leave the roof and get down to the ground. Sometimes in the wild, Canada geese nest in high places, and the goslings can jump. “But here, it’s much higher. I don’t know whether the goose would actually be able to land safely,” Olsen said. Olsen has notified the University Facilities about the goose. For now, they plan to leave the goose where she is. “It is not causing any problems,” Steve Koppes, the associate news director at the News Office, said. Facilities, however, could not remove the goose and her nest even if they wanted to, since the Migratory Bird Treaty Act protects migratory birds against artificial removal. “I don’t know what the best course of action is. Whether we put down mats, or try to get them go inside the building and go down the elevator,” Olsen said. Besides closely monitoring the situation, Facilities has not responded to the potential danger of the goslings jumping off Searle.